DataView suggest, or DataSuggest, is used to add extra functionality to Webix select controls, namely richselect, multiselect, combo, multicombo and similar editors. It is based on Webix suggest list. 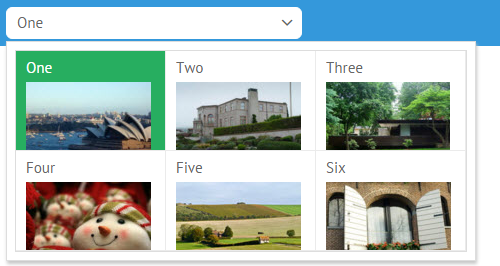 DataSuggest extension makes it possible to use Webix DataView in a dropdown menu which is great for inserting pictures while by default Webix list is used. 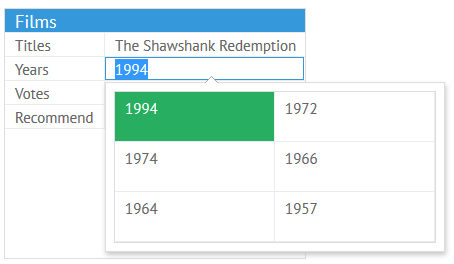 The extension can be used to redefine dropdown menu of select controls. When extended with DataSuggest, the constructor allows setting Webix DataView for a dropdown menu and defining its configuration right among the component's options. body (object) - defines complex config for DataView. data (array) - data for the options to choose from. If you use body property for DataSuggest configuration, data should be defined inside it. autoheight (boolean) - if true, set auto height for the DataView. False by default. DataSuggest can be used as a component editor as part of combo or richselect editors.